1/22/14 AJ Bridges.. 1/22/14 Scholarship Opportunity.. 9/30/14 MT: First DVC team..
1/17/13 Levy senior.. 12/18/12 MTs Claudy named.. 12/13/12 Young Monterey..
12/19/12 Girls prep basketball.. 12/4/12 MT tops Jesuit.. 12/13/12 MT Equaled last..
9/27/12 Teams sportsm.. 10/22/12 High school volley.. 5/24/12 MTHS W Track..
8/31/12 Ch13 Ath. of.. 4/12/12 MT golfer Reede.. 4/29/12 MTHS's Higgwe..
2/21/12 First DVC title for.. 4/5/12 Success of women's.. 11/9/12 MTHS knocks out..
12/28/11 MT girls claim Pack.. 11/09/11 Monterey Trail.. 1/19/11 Honoring Our Volunt..
12/10/10 MTHS Varsity.. 11/09/10 MT volleyball a.. Blessed with excellent baseball talent, the Mustang senior has been a diamond-in-the-rough, so to speak, at the school he loves. “I like to think of myself as the Michael Jordan of Monterey Trail baseball,” he proclaimed Friday after his team was blown out by Elk Grove, 14-3, in five innings. He hit .431 in 2012 on a squad that averaged .201 as a team. So far this spring Vartanian is hitting .548 for a Mustang squad that is 2-12. And, he’s encouraged with the improvement in the talent of the teammates. Vartanian has been a one-man recruiter for the baseball team at Monterey Trail. He’s plucked several of the Mustangs’ talented football players out of spring workouts and brought them to the baseball diamond. That raw athleticism has helped, he says. “We’re the underdogs and we try to come out and beat (theopponents),” Vartanian said. Guys such as Jermaine Bell, Paul Gooden and Josias Stevens who would normally be in the weight room with football coach T. J. Ewing this time of year have donned the gloves and spikes and are making it a go for the Mustang baseball squad. 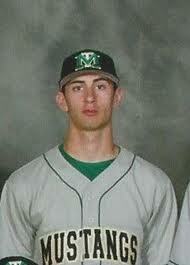 Last year, huge defensive end Leonard Wood, now a collegiate football player, was swinging the bat for the Mustangs. Helping Vartanian to try to put games in the win column is older brother Nick. Nine years his elder, Nick was one of the starting pitchers on Elk Grove’s 2003 Sac-Joaquin Section Division I championship team. He went on to play a couple years at CRC, then quit to learn the pipefitting trade. Nick gets off the construction site each day in time to come help coach his younger brother’s team. He likes to reflect on that 2003 Elk Grove team which featured him and David Hernandez, now one of the National League’s top set-up men. “We were just a couple tall, skinny kids then,” Nick said. He stays in touch with Hernandez occasionally and wishes, at times, he would have stuck with the sport like Hernandez did. “I guess I wanted to get a job and make some money,” Vartanian said. The income for a pipefitter is a bit more guaranteed than the dream of pitching professionally. But, Hernandez was one of the few to make it big. The love of the sport is behind the Vartanian’s desire to try to build a program at Monterey Trail. Clearly their work is cut out for them with baseball powers such as Elk Grove, Franklin and Davis alongside of them in the Delta Valley Conference. The younger Vartanian, despite the numerous team defeats over the past few years, has kept a positive attitude. “This team humbles me a lot,” he said. “I like working with people like that and battle against the harder teams.” Vartanian realizes he’s become a sort of trailblazer for Mustang baseball. “I want to try to get people to go (to Monterey Trail),” he said “They’ll get some good coaching there.” Jordan knows he’s in the spotlight right now and that if he can latch onto a college team it will be helpful to promote the Mustangs’ baseball program. “If I can go somewhere out of Monterey Trail, maybe people will start coming out here saying, ‘He did it out of here,'” Vartanian said. A few on the next level have noticed. A community college coach talked with Vartanian following Friday’s game. He’s a shortstop and one of the best in the DVC. A year ago he was somehow left off the All-Conference First Team despite batting over .400. This year has been forced to pitch, too. The Mustangs are a bit short of arms. Vartanian doesn’t seem to mind, especially with brother Nick helping. He attributes his high school success to his older brother. “He’s been working with me since I was little,” Jordan said. “He’s always been at all my games.” Mustang head coach James Therriault couldn’t have two better allies. Try convincing Qiana Levy her injury is serious. Even though doctors diagnosed her with a torn ACL, the leading scorer on Monterey Trail High School’s girls basketball team isn’t accepting the realization her season is over. The senior guard, widely considered the best all-around player in the Delta Valley Conference, is still planning to return for the playoffs. Her coaches, Brien Tillery and Louie Corpuz, aren’t quite as optimistic. “That’s how she is,” said Tillery. “She’s a fighter. I don’t think in her mind she thinks it’s that bad.” Levy was second on the team in scoring last season, and she was having an even better senior year until suffering her injury on Jan. 4 in a nonconference game at Nevada Union. She was averaging a league-high 16.8 points per game and was second in steals (5.2) and assists (3.8), third in blocks (1.5) and fourth in rebounds (6.3). Tillery, an assistant and coach in-waiting to replace Corpuz as the head coach next season, admittedly didn’t see the injury occur. As Levy drove baseline, Tillery turned to his bench to grab a substitute. When he turned around, Levy was grabbing her knee in pain. Corpuz, designated as the head coach this season but sits down while Tillery stands during games, wasn’t as fortunate. Now on crutches, Levy stood near the end of the line during introductions and waited to greet her starting lineup. That type of leadership is what Corpuz and Tillery believe is irreplaceable. “She has that tenacity. She plays with an edge,” said Corpuz. “The juniors that are going to be seniors next year are going to have to step up. They should be ready.” Despite Levy’s on-court production, Tillery said trying to replace her vocal leadership is the “hardest part.” “It’s a huge loss,” said Tillery. “She’s a leader. You are losing the voice of the team.” After a stellar nonconference, Levy was seemingly the consensus favorite for the DVC player of the year. She was dominant in a 65-62 nonconference win over River City on Dec. 7. In that game, she scored a game-high 28 points and also added seven rebounds, five steals and three assists. Levy had scored double figures in all but one of her first 13 games. She scored 20 or more points four times and had five or more steals in eight games. What bothers her coaches the most is the fact that Levy was injured before she was able to sign a national letter of intent to her future college. She also had planned to play in New York for the summer. Her stock was rising as well. Recruiters showed interest while Monterey Trail participated at the West Coast Jamboree in Antioch and recently Sacramento State and Arizona State contacted the school about Levy. “The thing that hurts the most is she’s a senior and she’s not signed,” said Tillery. What also hurts is Monterey Trail might have been a legitimate contender in Division I with Levy in the lineup. Without her, surpassing last year’s historic season is likely more difficult. “When we had her, I think we were a better team than last year,” said Corpuz. 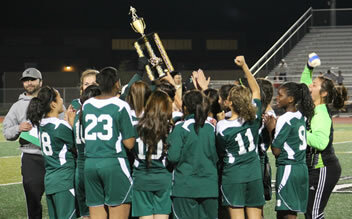 Last year, Monterey Trail captured the program’s first-ever DVC title. Qualifying as the fifth seed in the Sac-Joaquin Section Division I playoffs, they were upset in the first round by perennial playoff contender St. Francis. Even with Levy’s season-ending injury, the goals remain the same. “The first goal, like it has been, is to put another (league) banner up,” said Tillery. “After that, yes, we want to go further than last year.” Monterey Trail was one of only two teams to survive the first week of league without a loss. But it wasn’t easy. They nearly blew a double-digit lead in the second half before escaping with an eight-point home win over Franklin. 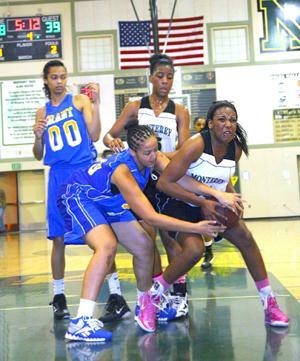 Jasmine Redmon, the team’s second leading scorer, led Monterey Trail with 21 points. Tiara Webb and Jasmine Chapman, who absorb more of a scoring role with Levy out, added 11 points apiece. “The chemistry is pretty strong,” Corpuz said. “We are really close as a team.” That chemistry should be tested in the next two weeks. Monterey Trail is in the midst of playing five consecutive road games, including Friday at Davis. Road games at Laguna Creek (Jan. 22), Grant (Jan. 25) and Franklin (Jan. 29) are still ahead before returning home Feb. 1 against Elk Grove. “We’re still the favorite,” Tillery predicted. “To me, the target is on our back.” The plan is for Tillery and Corpuz to swap positions next year, with Tillery becoming the head coach and Corpuz the assistant. Next year isn’t being discussed at the moment. For now, they want to give Levy a departing memory. Monterey Trail High School volleyball coach Kingsley Claudy was named one of six recipients for the 2012-13 Sac-Joaquin Section Model Coach awards. This is the 12th year the Sac-Joaquin Section has announced winners and the first time the Elk Grove area has been represented since 2007-08. Sheldon softball coach Mary Jo Truesdale was among the honorees that year. 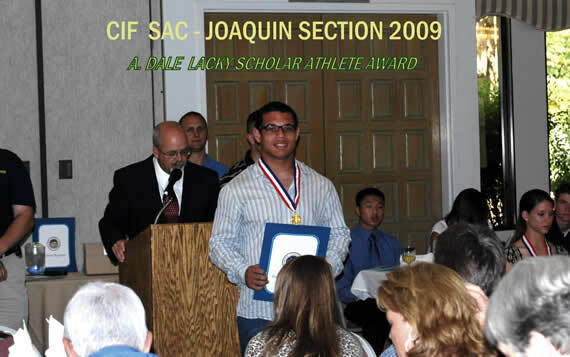 Truesdale was also inducted into the Sac-Joaquin Section Hall of Fame this year. The only other previous Elk Grove-area winner was former Sheldon golf coach Denise Aguilar, now the school’s athletic director, in 2006-07 To date, 74 coaches have been honored from 51 different schools. “The CIF does a great job of supporting coaching education programs and promoting sportsmanship, so to be chosen by them is a huge honor,” said Claudy. “I take a lot of pride in the work that I do and to be recognized for contributions I’ve made to high school athletics is a thrill.” The award honors coaches who are positive role models with the schools and communities, the Sac-Joaquin Section wrote in a press release. Each of the six model coaches will receive a plaque and a lifetime Sac-Joaquin Section pass at an awards breakfast on April 16, 2013 at Hutchins Street Square in Lodi. Each member school in the Sac-Joaquin Section waspermitted to nominate one male and female coach from its staff. Those names then went to the leagues, and each league was then directed to select one male and one female coach and send those to the Section office for consideration. Claudy is the first Model Coach winner for Monterey Trail. Claudy has coached boys and girls volleyball over the last 23 years at three different high schools in the Sacramento and Elk Grove area and is currently the Monterey Trail boys and girls volleyball coach. His two-plus decades of coaching include previous stops at Florin and Valley. Claudy has won 10 league titles in boys volleyball and has advanced his girls volleyball teams to the Sac-Joaquin Section playoffs for eight straight seasons. He has also been named the boys coach of the year eight times and girls coach of the year five times. All high schools, in the realm of athletics, are known for successes of specific sports. Monterey Trail was first categorized as a “football school” after back-to-back appearances in the Sac-Joaquin Section Division I championship game in 2009 and 2010. Girls basketball announced its rightful spot in line after the program’s first-ever Delta Valley Conference title last season. Now, boys basketball might be next. Manfredi seemingly figured it would’ve happened by now, especially with a group expected to contend for a league title two years ago. That season, in 2010, Monterey Trail was vastly inconsistent in the second half of the season and finished five games out of the league race. They eventually snagged the 16th and final seed in the playoffs and lost to Sheldon in the first round. That came three years after qualifying for the Sac-Joaquin Section postseason in Division I for the first time, where they lost to Pitman-Turlock, 56-52, in the first round. Last season, Monterey Trail won just twice over the final month of the season and finished 6-21 overall. Only two weeks into the 2012-13 regular season, they were already just one win shy of equaling last year’s total. 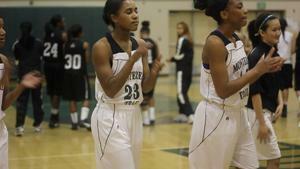 Monterey Trail had won five straight since losing to Woodcreek, 66-53, in the season opener. That streak came to an end at the Monterey Trail-hosted Mark Macres Tournament last weekend, losing in the first round to eventual runner-up West-Tracy. “We had the lead for most of the game,” recalled Manfredi. “Then we showed our youth and inexperience and they were able to close out the game. They deserved to win. They played better down the stretch.” Monterey Trail lost two of three games at the Macres tournament and fell to 5-3 overall. They were outscored by seven points in the fourth quarter of a 62-59 loss to West in the tournament opener. In the consolation bracket on Friday, a balanced offense and strong fourth quarter overwhelmed Christian Brothers, 57-39. Monterey Trail led by just three before outscoring Christian Brothers 25-10 in the fourth. Ten different players scored for Monterey Trail and five had at least seven points or more. Gabe Tavora had a team-high 12 points and Jackson had 10. Daz Tillery added eight and Jhajj and Lintz each had seven.Jhajj made 7 of 10 three-pointers and scored a team-high 25 points in a 71-51 loss to Campolindo on the tournament’s final day. 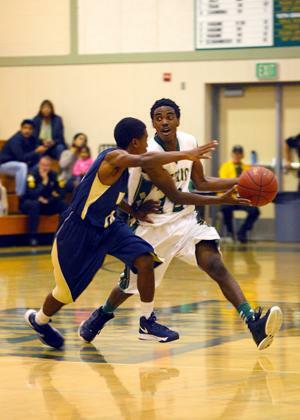 Kevin Sanford was the only other Monterey Trail player in double figures with 10. Campolindo led 28-8 after the first quarter. Pleasant Grove became the second two-time winner in Macres tournament history, beating West 77-55 in the championship game. Granite Bay won back-to-back titles prior to Pleasant Grove in 2009 and 2010. The tournament started with a four-team field in 2007, won by Monterey Trail. Bella Vista claimed the tournament title in 2008. For Manfredi, the tournament has steadily evolved each season. “I went into it thinking that any of the eight teams could win it this year,” he said. “It’s one of those tournaments where you can easily go 3-0 or 0-3.” Monterey Trail will have another chance this weekend for a possible second December tournament title. They are currently participating in the Mel Good Invitational in Yuba City. There’s no need to tell Monterey Trail boys basketball coach Ken Manfredi how young his team is. He already knows. The Mustangs, fresh off a 6-21 record in 2012, have only two seniors returning from last year’s team and will be playing with two sophomores and a freshman. Manfredi won’t allow the youth and inexperience his team faces to be an excuse or something the Mustangs should fear. Manfredi is still unsure who will be contending for the DVC title this season, but he expects a long and competitive road for the league championship. Franklin is likely the favorite again, although it appears to be wide open among the six teams. “This early in the season every team in our league is top competition,” Manfredi explained. “Each member of the DVC is capable of being the top team in our league. I expect to be playing in an extremely competitive league this season.” Monterey Trail opens league play Jan. 9 at Grant and two days later plays at Franklin. Nathan Lowery is a Laguna Creek High School journalism student. Multi-talented Mustang – No. 12 Monterey Trail, the defending Delta Valley Conference champions, are off to a 6-2 start, and a lot of credit goes to 5-5 senior guard Qiana Levy. The returning all-league player leads the team in scoring (17.6 points) and rebounding (6.3) and is second in steals (5.4) and assists (4.3). Coach Louie Corpuz, who has worked with her since seventh grade, said Levy is a phenomenal student and a leader on and off the court, finds time to work as a volunteer coach at Edward Harris Jr. Middle School and is in Monterey Trail’s Impulse Dance Company. In case there wasn’t enough excitement entering this weekend’s competitive school-hosted Mark Macres Tournament, the Monterey Trail boys basketball team added to the already stacked field by clinching a tournament title of its own a week earlier. The Mustangs, with 10 first-time varsity players, won the Jack Scott Tournament after a 64-56 win over Jesuit, the defending Sac-Joaquin Section Division I runner-up. Sanam Jhajj scored a team-high 20 points for Monterey Trail, which won the tournament title for the first time in five attempts. Leondre Lintz and Brian Jackson each scored 16 points. Gabriel Tavora was named the tournament MVP. Jesuit’s Lake Lutes scored a game-high 25 points. Monterey Trail escaped with two tight wins in the first two rounds of the tournament. After opening with a 65-63 win over Oak Ridge in the first round, Monterey Trail slipped past host Rio Americano, 56-52, in the semifinals. Now, Monterey Trail returns home to host one of the top early-season tournaments in the Sac-Joaquin Section. The Macres Tournament begins Thursday and concludes Saturday with the championship game at 6:45 p.m. All games will be played at Monterey Trail High School. Defending tournament champion Pleasant Grove, a Division I semifinalist last season, headlines the eight-team field. Pleasant Grove will play the final game of the first day, against Reno at 8:30. That winner will play Granite Bay, a field regular since the tournament started six years ago, or Campolindo, a first-year participant, in the semifinals. The top half of the bracket includes the first game of the tournament on Thursday, Christian Brothers/Foothill at 4, and Monterey Trail against West-Tracy at 7:30. Semifinals are scheduled for 7 and 8:30 on Friday. Scott Ellison knows his girls volleyball team wants to win matches and be a successful program. But the personality and mentality of his players are what make the Monterey Trail High School team so special. 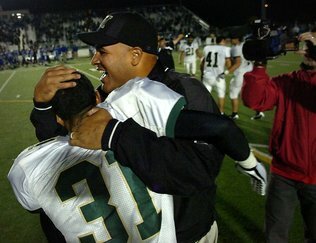 When Ellison took over the Elk Grove program in 2007, he asked his players what kind of team they wanted to be. “I told them this is their experience,” Ellison recalled. “I told them I can coach them whatever way they want.” His players told him they wanted a two-part system. They wanted to be taught like elite-level athletes. And they wanted to be sure their personalities were given full exposure. What has transpired has turned the No. 15 Mustangs (17-7, 7-0 Delta Valley Conference) into a perennial power team with a big personality. After every game, “win, lose or draw,” as Ellison puts it, the team does what is now called the “sportsmanship celebration.” Monterey Trail players, after every home match, grab a player from the opposing team and lead them in a dance to “Cupid Shuffle.” “I always tell the opposing coach about it and invite them to let the girls enjoy a hard-fought match with some celebration,” Ellison said. 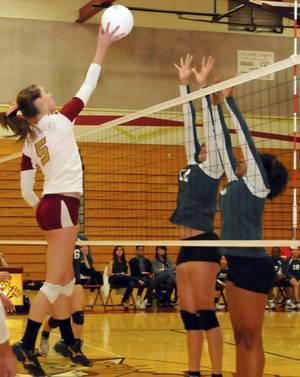 This season, the Mustangs, who play their final regular-season home match against Grant on Tuesday at 6 p.m., hope to have the opportunity to dance in the playoffs, despite a deep Sac-Joaquin Section Division I field. Championship week – Two league championships are up for grabs this week with matchups of teams in The Bee’s Top 20. On Thursday, No. 12 Bear River will host No. 7 Placer for the Pioneer Valley League title. Placer is 7-0 in league, and Bear River’s only defeat came at Placer on Oct. 9. Bear River coach Matt MacDonald was quick to praise Placer for the win but quickly noted their next meeting would be for the league title. Also Thursday, Monterey Trail and No. 16 Davis will play for the Delta Valley title. Davis’ only league loss came at Monterey Trail on Oct. 9. High school sports are extremely competitive and often, with the pressure to win, sportsmanship is overlooked. Two local high school volleyball teams showed that sportsmanship can make any game more enjoyable, win or lose. During the Monterey Trail Mustangs’ game on September 18th, they beat Pioneer High School in three games, but the real show was after the game. Instead of gloating over their victory, the Mustangs grabbed the Pioneer girls and began dancing with them. Mustangs and Patriots danced. Even the coaches got into the mix, dancing a little to support the cause. One KCRA insider wrote that he was “blown away” by the sportsmanship the Monterey Trail girls showed. This is an example that when the last point is scored, these players will be measured by the goodness in their hearts rather than by the strength of their hits. She excels on and off the court. Summer Tackwood maintains a 3.6 GPA at Monterey Trail High School, and the volleyball player hopes to lead her team back to the playoffs. Her game started long before her years at Monterey Trail High School. Tackwood says she fell in love with volleyball in 5th grade. “Teamwork, you have to rely on everyone to get job done, work as one,” said Tackwood about why she loves volleyball. She has high hopes for the team as they begin the season. “We look great! Each year we improve and we’ve improved a lot,” said Tackwood. Esther Higgwe hopes to use track and field as a springboard to bigger things.Her goal is to earn a college scholarship, become a pediatrician and return to her native Nigeria to open a hospital. The Monterey Trail High School senior sprinter’s performance in Saturday’s star-studded 32nd annual Sacramento Meet of Champions at American River College can only help. Higgwe won the girls 100- and 200-meter races and anchored Monterey Trail’s winning 4×100 relay to win the Girls Track Athlete of the Meet award. “I’m so excited right now,” Higgwe said after running a personal-best 11.86 seconds in the 100. “I’ve been trying to break 12 seconds for so long.” Higgwe’s time pushed her to No. 5 in the state 100 rankings. Higgwe credited a strong start – “I stayed down instead of popping right up” – and a relaxed finish in edging Cosumnes Oaks freshman Natsumi Mcgee, who also cracked the 12-second barrier in 11.97. Higgwe won the 200 in 24.50 to move to No. 8 in California. 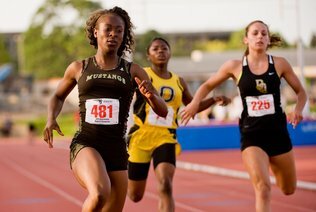 Her strong anchor leg helped Monterey Trail to a time of 47.43 in the 4×100, sixth best in the state. James Reede III is accustomed to historic achievements for the Monterey Trail High School golf program. 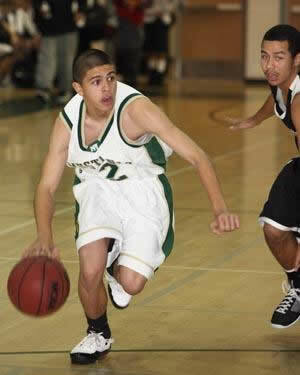 He became the school’s first-ever Sac-Joaquin Section Division I qualifier, doing so as a freshman in 2009. That year, he missed qualifying for the Sac-Joaquin Section Masters tournament by just two shots. Now, he is the first golfer in school history to receive a scholarship. Reede, with a 3.33 GPA, had been admitted to 11 colleges and was recruited by five of them for golf scholarships. He eventually committed to Jackson State University, a member of the Southwestern Athletic Conference (SWAC) from Jackson, Miss., and will sign his national letter of intent on Monday. Eddie Payton, the brother of NFL Hall of Famer Walter Payton, coaches the men and women’s golf teams at Jackson State. Reede is planning to major in mechanical engineering. In his fourth season as team captain, Reede was voted as the team’s Most Valuable Player for three years and was a student assistant coach for the girls team the last two years. Last August, he won the Western States Golf Association Junior Championship and automatically qualified for the 2012 Junior PGA Championship. Learning to golf at the age of 4, he quickly joined the Northern California Minority Junior Golf Scholarship Association two years later. He currently volunteers as a golf instructor working with inner city and disadvantaged youth and has over 425 hours of service. 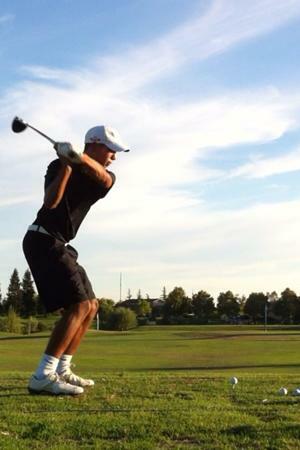 He has participated in the First Tee of Greater Sacramento since 2007 and was named one of 60 national First Tee of America Scholars for the Class of 2012. Maybe most notably, Reede is one of the primary reasons golf is still played in the Elk Grove Unified School District. In 2009 he befriended Champions Tour and Charles Schwab Cup winner Loren Roberts, resulting in Roberts’ donation of $70,000 to the EGUSD to preserve the golf programs at the nine district high schools. Still, Reede is hardly reliant just on his golf game. He published an article on the USGA JuniorLinks website in 2007, plays the Jazz Saxophone, and has a first Dan Black Belt in Taekwondo. Success is often contagious. The Monterey Trail High School athletic department is no different. After a historic run by the girls basketball team, which won the Delta Valley Conference title for the first time and qualified for the Sac-Joaquin Section Division I playoffs, the girls’ soccer team got off to a hot start at 6-1-1 overall, including a title at the River City Raider Cup Tournament. Sustaining that momentum wasn’t as easy. “Our girls really stepped up [in the River City Tournament],” said Monterey Trail head coach Tova Clemmensen. “They played well against Vacaville in the championship game. It gave us a lot of momentum to start the season.” Four straight losses to West Campus and conference rivals Elk Grove, Davis, and Grant has Clemmensen questioning where her team stands right now, and whether the playoffs are still a possibility. The Mustangs had a much-needed week off for spring break to try and rebuild the team chemistry in an attempt to finish the season as they started it. “In the past few weeks, we’ve had trouble connecting on the field,” Clemmensen detailed. “We need to try and rebuild our teamwork, learn to play more to our strengths and be more competitive.” And despite sitting at the bottom of the Delta Valley Conference, the season is not yet a loss for Clemmensen. Not with the talent and experience that is developing on the Monterey Trail roster. “We have a lot of young players that have great experience with club soccer,” she said. “Several sophomores played varsity last season and we’ve had a lot of parent support this season. More have been at games this season than ever before which is helping us out tremendously.” But it doesn’t end there. Clemmensen says a major competitive advantage that the Mustangs have is Trystan Bolds and Tiara Webb, two freshmen also on the Monterey Trail basketball team. “Tiara, our top scorer, and Trystan both played varsity basketball this year and have brought that winning spirit that our soccer team needs in order to be successful,” said Clemmensen. 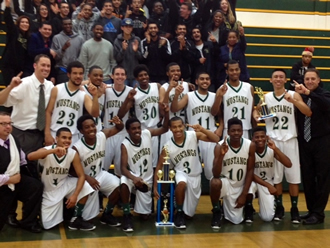 For the first time, Monterey Trail High School has a basketball league championship. With grins from ear to ear, the Lady Mustangs came out of the locker room after its 71-52 win over last Grant Friday night wearing white Delta Valley Conference champions 2012 T-shirts. A large crowd of family and friends were waiting for the girls’ and greeted them with loud applause. “I knew in my heart we’d be here,” forward Summayyah Wiggins said. “It’s a phenomenal feeling, it’s hard to describe. I am so thankful that we finally made it to this point.” The 5-10 senior wrapped up a 21-5 regular season by scoring 18 points in the second half – 22 overall – in running away from the Pacers in a big third-quarter outburst. “It feels so good, for this to come on Senior Night,” Monterey Trail head coach Brien Tillery said. “When we first took over the program, we asked the girls, ‘Who is your rival?’ They said, ‘Grant.’ This season couldn’t come down to anything else.” The Lady Mustangs finished the conference schedule with a 9-1 record, winning the DVC by two games over the Pacers. Grant went 7-3 in league, although two of those losses came against Elk Grove, which won just twice in league. MT girls claim Pack tourney title The Monterey Trail High School girls basketball team might want to ask about using Cosumnes Oaks’ gym as their unofficial home court. Monterey Trail, which finished 11-16 overall last season and just 6-8 at home, is 5-1 overall in two Running with the Pack Tournaments at Cosumnes Oaks, including a third-place finish in 2010 and a tournament title last week. Under first-year coach Louie Corpuz, Monterey Trail is off to a 9-3 start and has won four of their last five games. After scoring just 20 points in the first three quarters combined, Monterey Trail scored 23 alone in the fourth quarter of a 43-36 win over Argonaut in the championship game of the Running with the Pack Tournament. Jasmine Redmon had 13 points and eight rebounds for Monterey Trail. Qiana Levy scored 11 points. Four different players reached double figures in a 66-19 rout of Encina Prep in the tournament opener. Phoenisha Schuhmeier scored a game-high 15 points, nearly outscoring Encina by herself. Summayyah Wiggins scored 14 points, Levy had 12 and Redmon had 10. Monterey Trail scored 30 first-quarter points and only allowed five points in the second half to Encina. Monterey Trail had another strong first quarter in the semifinals, outscoring Sierra of Manteca by 14 points en route to a comfortable 58-28 win. Wiggins had 14 points and 11 rebounds. Jasmine Chapman scored 11 points, and Levy added 10. It was the second time this season Monterey Trail, playing this week at the Folsom Tournament, reached the championship game of a preseason tournament. Earlier this month, they lost to River City, 63-53, in the finale of the River City Shootout. Cosumnes Oaks, the only other Elk Grove-area team in the tournament, won the third-place game after rallying in the second half to beat Sierra 42-36. Cosumnes Oaks scored only 12 points in the first half, but outscored Sierra 30-18 over the final 16 minutes. Cosumnes Oaks’ Kanisha McDowell led all scorers with 15 points. McDowell scored a game-high 20 points in a one-point win over Lathrop, 57-56, in the first round. Maya Hailey added 11 points, and Alyssa Bray scored 10. In the semifinals, Cosumnes Oaks scored just 15 first-half points and lost to eventual runner-up Argonaut, 45-33. Samantha Stinson was the only Cosumnes Oaks player in double figures, scoring a team-high 10 points. It was the first time Cosumnes Oaks scored fewer than 40 points since the season opener, a 56-37 loss to Laguna Creek. Cosumnes Oaks is currently participating in the West Coast Jamboree before initiating their Sierra Valley Conference schedule Jan. 4 against River City. Anjelica Doroen tossed the ball about 12 feet in the air and waited for it to come down. The Monterey Trail senior then leaped in the air and smashed an ace that landed in the middle of the Golden Valley court. With that, the Mustangs’ setter set the tone for the night. 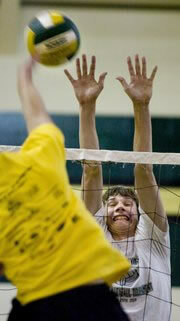 Monterey Trail’s aggressive serving gave the Cougars fits. The Mustangs were impressive in all other phases of the game as well as they defeated GV 25-8, 25-19, 29-27 in the first round of the Sac-Joaquin Section Division 1 playoffs on Tuesday night at Cougar Arena. “They served very aggressively and to their credit they did it with a high percentage,” said Cougars coach Matt Thissen, whose team finished with a 14-4 record. Doroen recorded aces on two of her first three serves and finished with five aces. The Mustangs (24-5) finished with 10 aces in the match. When Doroen wasn’t racking up aces, she was distributing the ball to the Mustangs hitters all over the floor. The Cougars had a shot to extend the match when they erased a 24-21 deficit with a mini 3-0 run. Golden Valley actually served for the game at 27-26, but Monterey Trail’s Alex Holt came up with a kill and the Mustangs closed out the match with two straight points. 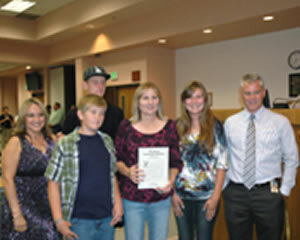 Linda Ford was recognized as an Education Partner at the September 6, 2011, meeting of the Elk Grove Unified School District Board of Education. Linda has been a key volunteer at Monterey Trail High School and the Monterey Trail region since her first child enrolled there in 2008. She has been an avid supporter of student government and activities while encouraging all three of her children to participate in the Monterey Trail and Edward Harris, Jr. Middle School leadership programs. Linda has also served as a board member for the Monterey Trail Athletic Booster Club,donating her time in organizing and working in the concession stand and helping to coordinate annual team banquets. She also serves as a board member and treasurer for the Junior Mustangs Football program. She promotes the program in the community, solicits sponsorships from local businesses and coordinates and trains parent volunteers. James W. Reede, III of Monterey Trail High School won the Western States Golf Association Jr. Championship in Las Vegas last weekend. His victory made him the first of the automatic qualifiers for the 37th annual Junior PGA Championship. Reede was not alone in his victory. 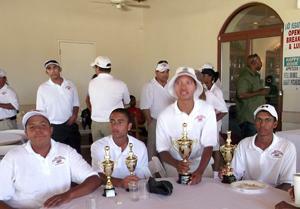 Sacramento-area golfers dominated the four-day tournament. Julian Woodfork of McClatchy High School placed third in the field of 60 golfers, and Will Smartt of Kennedy High placed 10th. In three years, Robert Longan has built a track powerhouse at Monterey Trail. A key piece of evidence is the Mustangs’ recent dual meet against Davis. 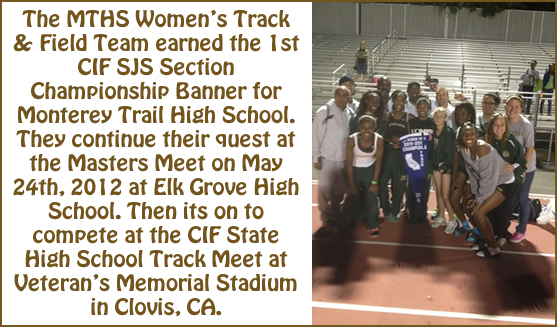 The girls varsity track team defeated Davis, 69-67. The boys came close, losing 74-62. The frosh-soph boys also beat the Blue Devils. Davis loses dual meets about as often as snowstorms blanket Elk Grove. With their depth in the distance and jumping events and their growing strength in the sprints, Davis is a force. Yet, the Mustangs pulled it off. “Davis is a team that could win the state team title,” Longan said. “They are so deep.” Laguna Creek track coach Bryan Jilka agrees. “It’s huge,” Jilka said. “Davis never loses a dual meet.”The credit goes to Longan, Jilka says. A competitive environment is one reason for the team’s success, Longan says. “We preach competition every day, and they’ve embraced it,” he said. What that means for the runners is that practices are competitive and busy. It also means that the athletes are constantly on the move. There’s no standing around at Monterey Trail practice. “It helps make the time go by,” said Longan. The program continues to grow. There are currently 110 boys and girls on the team. Longan says it’s not a matter of his going out and recruiting runners. Students are coming out because of positive word-of-mouth about the team. The results are in the results. The girls team is on a path to win the league outright, Longan says. If they can beat the Blue Devils in the Delta Valley Conference meet on May 13-14, they have sole possession of the title. If Davis wins, they will likely be co-champions. He also believes the frosh-soph boys have a good chance of winning the league title. The boys varsity team is also deep and young. Longan expects them to make a run at the league title next season. Their only dual meet loss has been to Davis. The frosh-soph girls’ only loss was also to Davis. Last year the boys and girls varsity teams finished second in the league, losing to Jesuit and St. Francis, respectively, in the Delta River League. Another sign of success is having 17 athletes invited to the Woody Wilson Invitational on Saturday at UC Davis. Athletes qualify for the meet on the basis of their times and distances, so 17 is a good number for the Mustangs. Highlights from the meet included an 11-second jump in the 4×400 relay team’s time from 4:14 minutes to 4:03. “They’re really young and the up and coming track stars,” Longan says. The team is composed of Ciara Levy, A’Jah Love, Desiree Turner and Esther Higgwe – all underclassmen who look to anchor a strong team next season as well. Mary Osumuh, long and triple jump; Phoenisha Schumeier, long jump and 100 meters; and Daria Beard, high jump, are also key members of the girls varsity team. On the boys side, Alberto Villa recorded a school record 2:02 minutes in the 800 meter at the invitational. Delvonte Johnson, 200 and 400, and Drake Tofi, high jump and pole vault, have also been key in dual meet competition. [top] MTHS Basketball Player, Ota Okungbowa signs letter of intent! This morning, Ota Okungbowa, a senior guard from Monterey Trail High School, signed a letter of intent and an athletic scholarship to attend and play basketball for California State University East Bay. 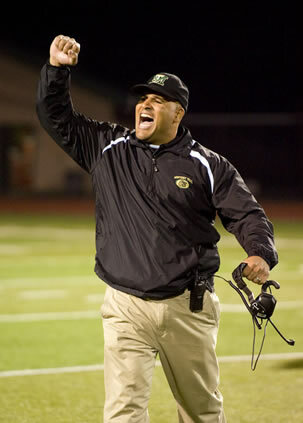 ELK GROVE, CA – T.J. Ewing, who coached his Monterey Trail Mustangs to the Sac – Joaquin Division I Section Championship game the past two seasons, has been named the 2010 News10 High School Football Coach of the Year. Ewing’s Mustangs were resilient as the roster dwindled to only 25 players, most of whom won’t be mistaken for blue-chip talent. Despite being relatively small in numbers, as well as talent, the Mustangs reached the second straight Division I Section Championship, falling last season to Nevada Union and losing this season to a sizable Pleasant Grove team. The Mustangs ended up 10-4 on the season, and entered the playoffs as a 10th seed, only to win on the road and upset the likes of Modesto (8-2), Napa (10-1), and Granite Bay (8-3), all who seeded higher than Monterey Trail. The Mustangs gave the Grant Pacers, undefeated until the Division II Section Championship loss to Folsom, the toughest opposition they had faced in the regular season. The Mustangs fell to the Pacers 28-22 in the deciding minute of play. Monterey Trail’s success in the regular season came against formidable competition including Fairfield, Nevada Union, and Franklin (Elk Grove), a team that was undefeated heading into that week. “It’s about working smart,” said Ewing. 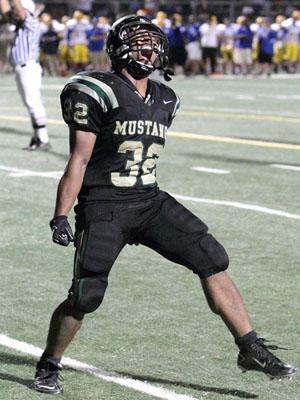 “There’s no hesitation or question on what you’re doing and it’s a proven product.”The Mustangs punished their opposition throughout the season with strong will and physical play, a style in which coaches of the opposition, like Granite Bay’s Ernie Cooper became “nervous” to face. Cooper admitted to News10 prior to the Division I semifinal game against Ewing’s Mustangs that they would be the toughest opponent they would face all year and they were nervous because they would hit them in the mouth on every play. Ewing’s teachings and his preparations has area coaches taking notes…literally. Ernie Cooper took nine pages of notes when Ewing spoke at a coach’s clinic in the off season at Sacramento State. “It’s more than football,” Ewing said. “All these coaches, that are coaching and teaching, they care about these kids. It’s all about building young men up.” It is more than football. The success he’s had on his student athletes on the field and off, and the impact he’s made at Monterey Trail, which includes building a community youth football program, is why T.J. Ewing has been named the News10 High School Football Coach of the Year. A few years ago, no one would have expected Monterey Trail High School’s girls volleyball team to have a 9-1 league record and be on their way to playoffs. However, this season the team has emerged as a volleyball powerhouse, dominating the Delta Valley Conference and finishing with 20 wins overall. Although a previously inexperienced team with a shortage of players, Monterey Trail dedicated time playing together on a club team and brought that same motivation to this year’s season. Last year, they came close to winning games but lacked the ability to finish the job. That changed in 2010. If the players had doubted their ability to win, that attitude has changed this year. After missing a playoff berth by two points last year, Monterey Trail motivated itself and created goals that they continue to strive towards. Some of those have already been accomplished. They earned their first playoff berth and won a league title. The next step is to win a playoff game. The leadership of their setter, Anjelica Doroen, and key outside hitter, Diamonte Harper, have become essential to Monterey Trail’s progress from last season. “Anjelica is a constant on our team,” said Ellison. “She has amazing hands and great athletic depth. Diamonte is a formidable hitter and her consistency in getting the ball to the setter is something that teams dream about.” Ericka Clay led the team with 180 kills, and Linda Tran led defensively with 315 digs. Although Monterey Trail has had a successful season and beat the odds, they never forget that they must also be an example of sportsmanship. “We show up to compete, but not at the expense of losing our character,” Ellison explained. “These are characteristics that I learned during my many years as an athlete. I used these lessons as building blocks for my program and the girls accepted them.” The program continues to grow, perhaps even with a playoff win to add to its impressive 2010 resume. “That nervous sigh of relief vibrating from the walls of Mark Macres Memorial Stadium could be felt from Del Paso Heights. That exhale was courtesy of the Grant High School football program. After all, this was unfamiliar territory. Grant had never scored fewer than 49 points in a game all season. None of the games had been in doubt after halftime. This was the unbeatable force against an up-and-coming program, Monterey Trail. It wasn’t supposed to be close – at least not by the fourth quarter. The media darlings finally had to overcome adversity. Viewed as merely another minor roadblock on the path to a possible state-title berth, Grant realized quickly they are no longer in the Metro League, where blowouts were the norm. The Pacers’ first season in the Delta Valley Conference has already been vastly different. Stuck in a close game for the first time all season, the third-ranked team in the country rallied for 14 fourth-quarter points – including the game-winning touchdown with just 43 seconds left – to escape with a 28-22 win over Monterey Trail in front of a standing-room only crowd at Monterey Trail High School. In arguably the best high school football game in the four-plus year history of the Delta Valley Conference, Monterey Trail nearly did the unthinkable: shock one of the top teams in not only the state but also the entire country. It didn’t happen. “We’ve never played a nationally ranked team before, so we feel fortunate to be able to play these guys and have them in our league,” said Monterey Trail head coach T.J. Ewing, standing outside the players locker room and surrounded by coaches, former players and family. “You can define your program with games like these. We wanted this one really bad. “That was a heavyweight battle right there,” he added. “That’s what we want people to know about this school. Wehave great kids here that fight. They have a lot of love for each other and you can tell that when they play. The smallest margin of victory for Grant this season was 35 points. Just seven days earlier, they scored 49 first-half points in a 61-7 rout of Elk Grove, a team that nearly shocked unbeaten Franklin before losing on a late two-point conversion in a 29-28 loss.This was only Grant’s second game in the DVC after realigning from the Metro League. Another blowout seemed imminent early. Grant raced out to a 14-0 lead in the second quarter. Monterey Trail scored on its next possession to cut the deficit in half and then stopped a late drive at the 1-yard line as time expired at the half. Game on. Monterey Trail grabbed its only lead of the game with 1:55 left in regulation. But Grant needed just 1:12 to respond with the game-winner. “With these kids (at Grant) you’re playing with tremendous athletes,” said Ewing. “You can’t make mistakes. You have to play great football. Grant High School made great plays. Our kids played great. They played with heart, they played with emotion. We just didn’t make enough plays.” The game had three lead changes in the final 4 minutes. Tied at 14, Monterey Trail stalled on a remarkable 23-play, 10-minute drive at Grant’s 3 when quarterback Michael Calvan’s pass was intercepted on fourth-and-2 from the 14. Less than three minutes later, Grant running back Shaq Thompson scored on a 60-yard run to regain the lead at 21-14 with 3:59 left. Monterey Trail answered. Drake Tofi scored on a 37-yard run and Derek Bellamy added the two-point conversion for a 22-21 lead with 1:55 left. Ewing immediately signaled for the two-point attempt after Tofi scored and stuck with his decision even after Grant called a timeout to regroup. Bellamy was hit at the 1 and stretched his arms and the ball across the goal-line as he lunged forward. It was the first time Grant trailed all season. That lasted just 1:12. Grant’s ensuing drive started at the Monterey Trail 48 after Tofi’s intended pooch kick mirrored more of an onside kick and Grant recovered. Grant appeared to score the go-ahead touchdown on second down when quarterback Terry Shine lofted a perfect pass deep down the middle. But usually sure-handed Ronald Johnson, wide open at the 15, dropped the pass. Facing a third-and-11, Shine connected with Ference Lang for 18 yards to extend the drive. On the next play, Shine found tight end Darryl Paulo wide open down the middle for a 22-yard touchdown with 43 seconds left. Monterey Trail ran four plays on its final drive but failed to reach midfield. Grant was not fooled on a half-back pass that gained just four yards and, after a spike and an eight-yard completion, Calvan rolled to his left and threw incomplete as he was pressured and time expired. “We wanted him (Shine) in the pocket throwing the ball. We thought that gave us the best chance to win,” said Ewing. “He just made a couple of big throws.” Grant led 14-0 just 11 seconds into the second quarter after Thompson’s 23-yard touchdown run in the first quarter and Lang’s 55-yard run on the first play of the second quarter. Monterey Trail converted a fourth-and-goal from the 1 on Calvan’s sneak to cut the deficit to 14-7 and then tied the game on Bellamy’s 30-yard run on the first series of the second half. Monterey Trail rushed for 344 yards, including a team-high 159 from Tofi and 105 from Bellamy. The final 20 minutes of regulation displayed why Grant is the Sac-Joaquin Section’s consensus best team. 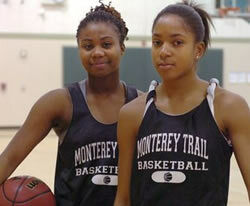 And why Monterey Trail is proving that last year’s Division I runner-up was not a fluke. The over-flowed crowd was estimated as the largest in school history. More than two-dozen fans parked along the fence in the parking lot and watched the game from outside the stadium. Evan Favors had a dream come true and made history, all at once and all with the swoop of a pen. The Monterey Trail High School defensive back signed a national football letter-of-intent to compete for University of Nevada, Reno. He is a versatile, explosive athlete who was paramount in helping the Mustangs reach the playoffs for the first time – and reach the Sac-Joaquin Section Division I championship game. And he’s the first full football scholarship player to emerge from one of the newest Elk Grove Unified School District schools. “Great kid, great player,” Monterey Trail coach T.J. Ewing said. Favors had offers and interest from UC Davis, Cal Poly and San Jose State. They were feel-good rivals for years, from middle school through college. Now each is coaching a local high school football team, and neither wants a piece of the other. It’s no wonder T.J. Ewing of Monterey Trail and John Heffernan of Burbank are so antsy these days. Their teams square off in a Sac-Joaquin Section Division I quarterfinal Friday night at Monterey Trail. The coaches will go in with mutual respect and depart with mixed emotions. Someone has to lose. The coaches grew up in San Mateo. Sports was the connection. They played for rival high schools, and both wound up at College of San Mateo. Both landed scholarships – Heffernan at Sacramento State as a defensive back and Ewing at Eastern Washington, in the trenches as a center. And more similarities: Heffernan met his wife, Othelia, on the CSM campus. Ewing met his wife, Blanca, on campus. Both coaches are physical education teachers. Both have three children, including 6-month-olds. Both like to say they’re every bit the same as the tough-minded players they mentor. “We’re all cut from the same cloth,” Ewing said. Both run a veer offense and have defenses that rely on burst and aggression. Both teams reflect their coach’s come-stop-us mentality. Both coaches also endured growing-pain misery before any taste of glory. Heffernan, in his seventh year as the Titans’ coach, endured losing streaks before turning the corner. He led Burbank past Grant in Week 10 of the 2007 season to give the Titans their first outright league championship in 40 seasons. Burbank reached its first section title game a year ago, in D-II, losing to Grant 55-6. And just last Friday, Burbank upset higher-seeded Lincoln of Stockton 25-23 in a playoff opener as a No. 12-seeded upstart. Ewing is the only football coach in Monterey Trail’s five-year varsity history. He kept the Elk Grove Unified School District program afloat amid an early 18-game losing streak, which is not uncommon for new schools with no foundation. This season has been the breakthrough. There was the first-time win over Elk Grove. Then the dramatic and gutsy call to go for the win at Folsom in overtime – using a two-point conversion run by Drake Tofi – to hand the Bulldogs their only loss. 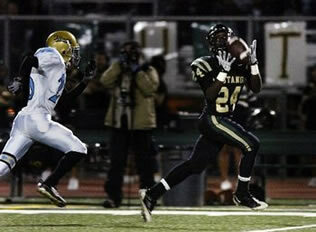 Then there was the program’s first league championship, a three-way tie with Folsom and Pleasant Grove. The school’s first playoff win came Friday, a 59-21 rout of Pitman-Turlock in a home game that included another overflow gathering of students, fans and teachers. After every game, regardless of outcome, Heffernan and Ewing call each other. The stories – the highs and the lows – are similar. Burbank, as old school as old school can be, opened in south Sacramento in 1962. While coaches come and go in the city schools, Heffernan has been a constant. He leads a team of gypsies, whose every game has been a road adventure since 2007 because of unplayable home-field conditions. A new community stadium is in the works. In the meantime, Heffernan hauls in portable lights and generators to run night practices. The Titans hit the field after a two-hour, after-school tutoring program. “We make it happen, by any means,” Heffernan said. “These kids succeed despite the shortcomings, but we don’t focus on what we don’t have. We focus on what we do have.” And that’s each other. Titans lineman Andrew Vaefaga comes to school every day in a swirl of emotions. His mom passed away in her sleep, Nov. 10 from heart failure. He has “RIP Mom” inked into the back of his shoulder pads. The Might Mustangs defy expectations, crush #12 ranked Elk Grove! Monterey Trail Football handed the #12 ranked Elk Grove thundering Herd its first shut out in 5 years. 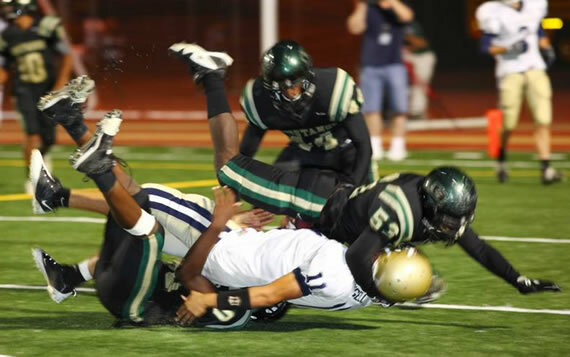 The Mustangs stampeded to a 27 – 0 route over its cross town rivals Elk Grove High. (photo) Elk Grove’s quarterback is escorted to the brand new turf field in Macres Stadium by Lamin Wilson and David Martinez. Elk Grove struggled the entire contest and despite this drive being their most productive of the evening, the Mustangs played insurmountable, shoulder to shoulder football all night. (September 18th, 2009) [top] Congratulations to Andre Larry! Ramon Canahuati recognized as an Education Partner! Ramon Canahuati was recognized as an Education Partner at the February 17, 2009, meeting of the Elk Grove Unified School District Board of Education. Canahuati has been a key volunteer at Monterey Trail High School and has donated his time in many areas. 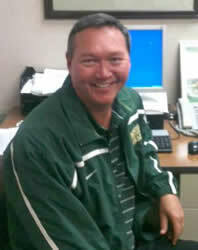 He has been involved with the Monterey Trail Athletic Booster Club since 2004. He has served as Booster Club president and currently holds the title of vice-president. In addition, he volunteers as the equipment manager for the Monterey Trail football team and volunteers his time to help maintain the athletic fields. Canahuati also serves meals to Monterey Trail athletic teams and helps run football camps in the summer. 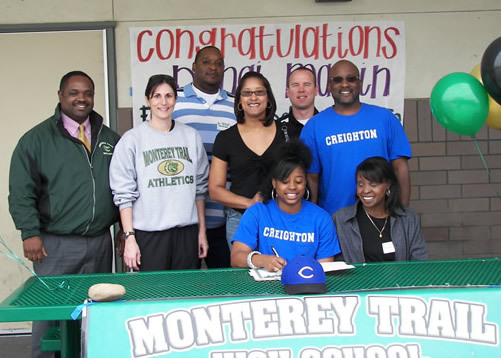 Danai Martin, Monterey Trail High School senior, signs her National Letter of Intent and accepts a full scholarship to play softball at Creighton University in Omaha, Nebraska. Danai is excited about the challenge of competing at the NCAA Division I level in The Missouri Valley Conference in the Midwest. Monterey Trail would like to say, “Congragulations Danai!” Thank you for your hard work. This is a fantastic accomplishment. This may be an up-and-down season for the Monterey Trail High School varsity boys’ basketball team. They’ve already witnessed some of the downs, losing two seniors to season-ending injuries. Plus, talented point guard A. J. Bridges has a bad knee and head coach Ken Manfredi is counting on three sophomores when the game is on the line. That didn’t stop the Mustangs from putting a scare into highly-touted Pleasant Grove last Friday night. The Eagles, behind a 12-0 run late in the first quarter, ran out to an 18-point lead and then held on to defeat the Mustangs, 77-73. Pleasant Grove’s leader, point guard Xavier Thames, scored 13 of his game-high 32 points in that opening stanza and was key at the end of the game when Monterey Trail pulled within three points with six minutes left. Bridges right away showed a bum knee wasn’t going to stop the 5-foot-10 senior. The Mustangs got the opening tip and got the ball to Bridges who proceeded to make a nice move to lose his man, drive down the lane and score the first two points of the game. But, the bigger, taller Eagles began dominating the boards and sunk some key three-pointers to run out to a 21-10 first-quarter lead. Ra’shauwn Brooks joined Thames in distancing Pleasant Grove from the Mustangs. He had nine of his 24 points in that first quarter. A three-pointer by sophomore Brandon Ogle early in the second quarter brought Monterey Trail to within six at 24-18 before Thames, Brooks and Glen Akerlund took over and gave the Eagles a 13-point halftime lead, 39-26. The Eagle fans began to settle in and enjoy the third quarter. Brooks scored on a layup following a steal and a nice assist by Thames to give Pleasant Grove a 50-32 lead with four minutes left in the quarter. Then, Manfredi called a timeout. “I told my guys to attack their zone and be really aggressive,” he said. “Defensively we made a change where A.J. guarded Xavier; no rotations, no help, a full box-and-one, and that really kick started our defense. Our defense is our best offense.” Behind a couple steals and drives by Ogle and buckets by Bridges and Odgen Shipman, Monterey Trail scored the next nine points. The third quarter ended on a seemingly impossible, off-balance jump shot at the buzzer by junior guard Ryan Cooper. Just like his NBA counterparts, he screamed loudly at his one-handed 18-footer and the crowd echoed his enthusiasm. The Mustangs were only down 57-51 to start the fourth quarter with the home crowd into the game. A three-point play by Ogle with 6:44 left brought Monterey Trail within three points at 61-58. He proceeded to score 15 of his team-high 29 points in that final period. “He’s got at really bright future,” Manfredi said of Ogle. But, Thames, headed to Washington State, came through like a guy destined to play Division I college basketball should play. A pair of drives and short jumpers followed by a key three-pointer by Akerlund stretched Pleasant Grove’s lead to 12 points with two-and-a-half minutes left in the game. Monterey Trail missed a couple inside shots on second chance rebounds and just couldn’t get any closer. Don’t let the charm, soft features and kindly smiles fool you. They’re teenage terrors, these two. Chezla Self and Aiwekhoe Okungbowa are all manners and good cheer in just about all settings at Monterey Trail High School, except deep inside the paint on the basketball court, where interior play is not for the meek. For these two seniors, the very thought of inside play has them suddenly baring fangs and flexing muscles. Self and Okungbowa (pronounced oh-CAN-bowa) especially seek rebounds, and they will fight and scratch and claw for every available board. And sometimes with each other, too. “We’ll have to yell out, “Same team!” Self said. Self and Okungbowa are four-year varsity starters who thirst for loose basketballs and playoff success for an Elk Grove Unified School District program still relatively new to this sort of thing. 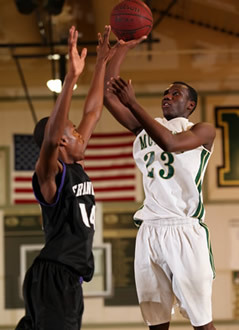 Okungbowa and Self are the top rebounding duo in the Sac-Joaquin Section. Okungbowa grabs 13.1 rebounds a game, Self 12.4. But how? Neither is particularly tall at 5-foot-7, and both are slender. But they’re fierce. 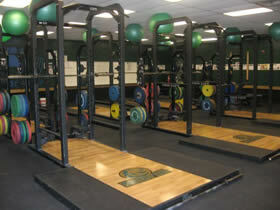 Power-Lift is the chief supplier of weight lifting equipment to the Monterey Trail Strength and Conditioning program. Our power lifting equipment empowers our students to drastically improve themselves helping them move their efforts to the next level. Power-Lift is an essential product line in top-level high school, collegiate and professional programs. Their equipment’s durability and excellent customer service are what initially intrigued Monterey Trail and what has moved our institution to continually purchase their equipment. We are currently using six 9’ power racks. Our weight room at Monterey Trail High School is very functional, being able to house 50+ athletes comfortably. It is one of the most regularly used rooms on campus. The Monterey Trail Athletics department has not only purchased superior products for our athletes, but we have also established some of the most modern training programs in use today. We have a committment to excellence and our weight training curriculum is no exception. Monterey Trail was recently displayed as a “Featured Facility” at http://www.power-lift.com/. At some point, coaches dream it. What if … the unexpected happens, and out of the blue a great athlete walks into the program? No fanfare or competition for his services, just somebody no one knew about who can really play. But it was no dream for Kingsley Claudy, boys volleyball coach at Monterey Trail High School. Last fall, one of the school’s top players, Johnathan Nguyen, sprinted up to the coach and said in so many words a volleyball star had arrived, special delivery from the Czech Republic. Name of Marek Slavik. Mad skills. Claudy asked Slavik, a 6-foot-4 exchange student from the village of Rosovice, to hit a few volleyballs. The 18-year-old obliterated them as onlookers ducked for cover. “Right away, you can tell he was a special player, an amazing athlete,” Claudy said. “He was the complete package. Just dominating.” Slavik’s impact on the Mustangs has been profound. The team was 17-15 last season and has improved to 20-7 so far this season. Volleyball helped Slavik’s transition from resident of a village with about 350 people to American student at a high school with more than 2,000. Slavik, who loves cars and talking, has become the team’s social epicenter. He augments his skills in athletics and socializing with honor-level grades and said he is fascinated by the Declaration of Independence. Slavik’s English has improved dramatically, and Claudy said he also has learned “a lot of American slang.” It’s “oh, my gosh” one moment and “my bad” another. The Mustangs’ lineup of Slavik, Nguyen, Jaskaren Bains, Nick Jew, Marcian Evans and Vadim Drozhzhin has become close. His teammates don’t want to see their foreign-born star head home. “When you see him play, it’s like, ‘Wow.’ He can do it all, and he’s been great to get to know,” said Nguyen, the team setter. “If I had to choose an All-American, it’d be him.” Slavik said he is torn about returning to his parents – his father is a manager for a book company, his mother a physical therapist – three younger brothers, fishing and his beloved motorcycle. “I have mixed feelings,” Slavik said. “I have the same feelings as I did before I came here. I don’t want to leave friends and family behind, but I was excited about the opportunity. Now I don’t want to leave my friends here and (the Halls). You’d think after ending an 18-game losing streak, a jubilant celebration would follow. Maybe a group of players dropped a barrel of Gatorade over the head of Monterey Trail High School football coach T.J. Ewing. Or another group of players high-fived and piled on top of each other as if they won the Sac-Joaquin Section Division I title. The Mustangs did none of the sort after defeating host Fairfield 53-30 last week. “The only thing we talked about was how to improve before we play Elk Grove (The Bee’s fourth-ranked team) Friday,” Ewing said. The Mustangs’ last victory was Sept. 16, 2005. They beat Rosemont 54-14 in a battle of relatively new programs. Ewing, however, never complained about his situation. He played perennial powers along the way, losing to the likes of Del Oro, Elk Grove and Jesuit. The Mustangs jumped out to a 34-14 lead last week and maintained control. Marcos Nevarez highlighted the victory with an 87-yard kickoff return and Gerome Johnson caught a 61-yard touchdown pass from Justin Gates. “We’re a humble group,” Ewing said. “There was no need to do a big celebration. We still have more to prove.” Declined to play — Del Oro freshman Aly Duffin and Oak Ridge sophomore Brittney Larsen declined to compete in the California Beach Volleyball Association 16-and-under National Beach Volleyball Championships on Sept. 2 in Manhattan Beach, fearing they would jeopardize their high school eligibility. The 14-year-olds, who represent the Sacramento Beach Volleyball Club, had qualified for the nationals by winning the Northern California Championships on Aug. 11 in Santa Cruz. Duffin and Larsen had to play in a higher age bracket because Larsen’s birth date just missed the under-14 cutoff. “It’s a big achievement to win any beach tournament,” said Tim Hill, director of the Sacramento Beach Volleyball Club. “They have the size, quickness and experience to play with anybody.” According to Larsen’s father, Marty, the families did not inquire at the Sac-Joaquin Section office to determine whether the girls could compete.